According to the release, Liberia’s Ambassador to Nigeria, His Excellency Professor Al-Hassan Conteh and other members of the Diplomatic Corps accredited to Nigeria and ECOWAS, and staff and heads of various ECOWAS institutionsattended the ceremony that held in Abuja, Nigeria on Thursday, March 1, 2018. Mr. Ally Coulibaly, La Cote d’Ivoire’s Minister of African Integration and Ivorians Abroad, and Mrs Khadija Bukar Ibrahim, Nigeria’s Minister of State for Foreign Affairs, were among other high-profiled dignitaries who also attended the event. The Commission’s outgoing President, Mr de Souza, in his farewell message outlined the Commission’s significant progress, the release adds. Mr de Souza named some of them as the ongoing ECOWAS institutional reform, the establishment of a regional television station, renewed commitments of Member States to the creation of the ECOWAS single currency by 2020, as well as plans for the construction of a new Commission headquarters. Mr de Souza, however, underscored some major challenges of the Commission, to include in particular, late payment of Community Levy by Member States, non-compliance with decisions of the ECOWAS Court of Justice, the stalemate in the political crisis in Guinea-Bissau, strengthening of regional integration, sustaining the gains made in managing staff welfare and cost control measures, among others. For his part, the new President of the ECOWAS Commission, Jean-Claude Kassi Brou, congratulated and thanked his predecessor for the impressive manner in which he led the regional organizationfor nearly two years. Welcoming the progress ECOWAS made at political, institutional, security, economic and social levels, the new President of the Commission pledged to further strengthen them. 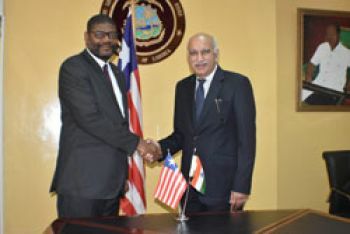 According to the Liberian Embassy’s release, Mr Brou named some of the challenges that he must address during his four years presidency as Member States' expectations in the areas of economic, social and human development, synergy of actions for greater efficiency in their implementation, sound business environment to support and finance infrastructure, among others. A native of Cote d'Ivoire, the new ECOWAS Commission President holds a Ph. D in Economics, an MBA in Finance from the University of Cincinnati, Ohio, United States of America and, a Master's degree from the National University of Cote d'Ivoire. Until his appointment as President of the Commission, Mr. Brou served as Minister of Industry and Mines in Cote d'Ivoire since November 2012. Prior to that, he was Economic and Financial Adviser to the Prime Minister of Cote d'Ivoire from 1991 to 1995. He was also the World Bank's Resident Representative for Chad from 2010 to 2013, and Consultant to the Government of the Democratic Republic of Congo. Jean-Claude Brou is married with two children, the release concludes.